Welcome to Your Maine Destination! Located near Bingham, Maine, we offer clean & comfortable, family-style accommodations in the lodge or in our private maine cabin rentals. The peaceful setting is of the mountainous wilderness while still on easily traveled roads. Along with lodging, we have activities available such as maine fishing, fly fishing lessons, hunting, kayaking, canoeing, wildlife tours, pontoon boat lake cruises, Offering top-quality Registered Maine Guide service, access to well-groomed snowmobilie and ATV trails, delicious home-cooked breakfast, and that “home away from home” feeling, you’ll want to come back year after year. Bob and Andrea Howe make you feel like family from the moment you arrive! Whether you are taking a walk in the wilderness or coming to hunt our world famous snowshoe hare, enjoy your stay in our beautiful B&B. Enjoy a fishing with ether our guided fishing service or a relaxing day of fly fishing by the shore. 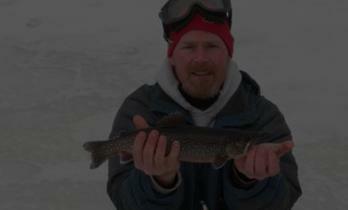 Click here to view our fishing trip packages. 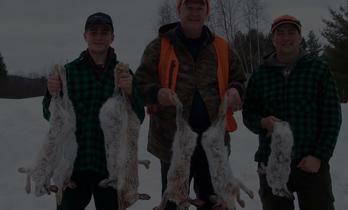 An all inclusive hunting trip awaits for our world famous Maine Snowshoe Hare and Whitetail Deer. 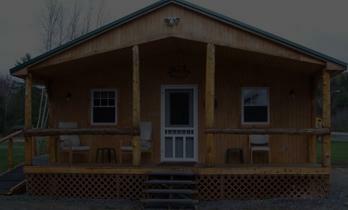 Click here to view our hunting packages. When were you planning on visiting?